***Cost-efficient Comedy Central is going to the bush leagues for its latest presentation. Fittingly it's called Lil' Bush: Resident of the United States, the first made-for-cell-phone production to make the leap from the palm of your hand to a TV screen. 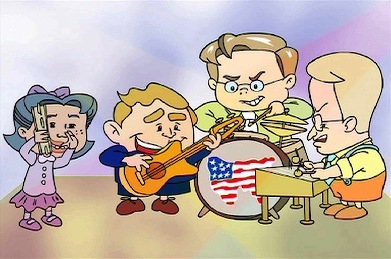 Created by Amp'd Mobile, the cartoon series stars Lil' George and his Lil' "White House posse," including Lil' Condi, Lil' Rummy (um, it's a bit late for him) and "the unintelligible, foulmouthed wisecracker, Lil' Cheney." Comedy says they're all like "Lil' Rascals with access to the A-Bomb." It's scheduled to premiere sometime next year on a network that previously lampooned the second Bush White House in That's My Bush! from South Park creators Matt Stone and Trey Parker. Recently released on DVD, the sendup of a '70s sitcom was canceled after eight episodes because Comedy Central deemed it too expensive. Lil' Bush doesn't look as though it will have that problem. ***Add durable Rick Schroder to the cast of Fox's 24, which returns for its sixth season with a two-night, four-hour event (Jan. 14-15). Schroder's character is CTU operative Mike Doyle, who will team with Kiefer Sutherland's agent Jack Bauer in some "crucial field operations," Fox says. 24's fifth season DVD collection hits stores on Tuesday, Dec. 5th. Other new additions to this season's cast include Chad Lowe, Powers Boothe, Peter MacNicol, Regina King and James Cromwell. ***CBS has gifted its second-year series Criminal Minds with a post-Super Bowl XLI slot in hopes of further growing its audience against Lost when the ABC series returns to Wednesdays in mid-February. Minds outdrew Lost in total viewers in their last two head-to-head matchups, but still trails among advertiser-craved 18-to-49-year-olds. "This is an outstanding opportunity to expose a series that is young in its life cycle and on the rise to an enormous universe of potential new viewers," says NBC entertainment president Nina Tassler. *** David Letterman will remain as host of CBS' Late Show until at least fall, 2010, the network announced Monday. Letterman has been with CBS for 13 years and is "one of the defining icons of our network," CBS Corporation president and CEO Leslie Moonves says. Barring unforeseen circumstances, this means that Letterman will outlast rival Jay Leno, who's set to bequeath NBC's Tonight Show to Conan O'Brien in 2009. ***Showing commendable patience with another highly praised but low-rated series, NBC has given Tina Fey's 30 Rock a full-season order. The comedy recently relocated to NBC's Thursday night lineup, where it follows Scrubs at 8:30 central (9:30 eastern). The Peacock's new Friday Night Lights and Studio 60 on the Sunset Strip also have received full-season pickups despite continued ratings woes.